Referring to the 1901 map below you'll see that there are two schools in Fitzroy Street. Although they are separate buildings their history is very closely associated. 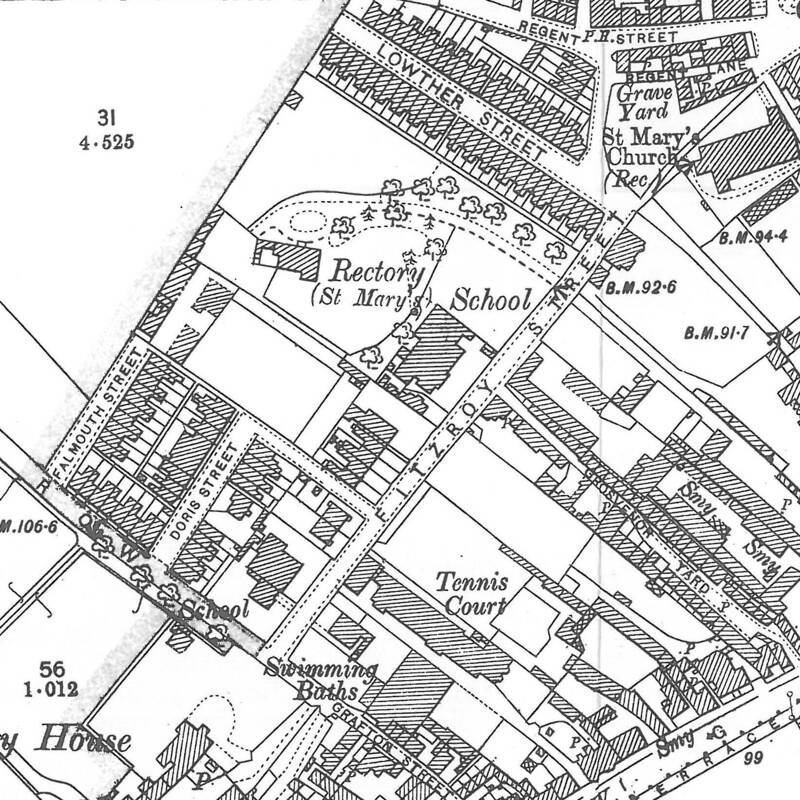 The school at the bottom of the map on the corner with Grafton Street (now Black Bear Lane) was originally the boys' school, that nearest the Rectory was the girls and infants school. Before these two schools were constructed the church had previously built a National School Room - it's not known exactly where this was, other than being near the church. This article may have had an effect though; as it was only two years later that the St Mary's School Board constructed two new schools, and typical of most schools at that time the boys were educated separately to the girls - in this instance separated by almost the whole length of Fitzroy Street. Vernon Swift, master ; Miss F.E. [sic] Black, mistress. Fanny was born in 1876 in Queniborough, Leicestershire. She can be seen in the school house next door to the girls and infants school in the 1911 census, living with 16 year old, Cheveley born, Hilda Olive Bell as her servant. Being still shown at the school in the 1936 directory, she was probably the last mistress at the girls' school when it closed in 1939 - she died on 29th January 1951 in Chesterfield, Derbyshire having never married and leaving quite a considerable sum in her will. The photo below shows the Schoolmistress' House as it is now. 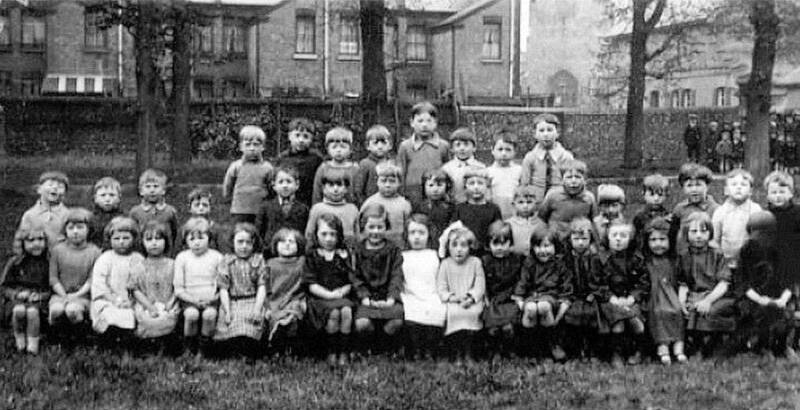 Both the boys and the girls and infants schools closed on 3rd August 1939 (many thanks to Newmarket historian Joan Shaw, who remembers this event; as she attended the infants school from 1937). World War II was declared almost a month later on 1st September and the new Secondary Modern school in Exning Road school was opened the following Tuesday on 5th September. Initially there was some hesitancy as to whether this was a good idea; as being a new building, and near the military airfield on the heath, the school looked liked it could have had military use, but the opening proceeded as planned (many thanks to Bill Smith for these details). 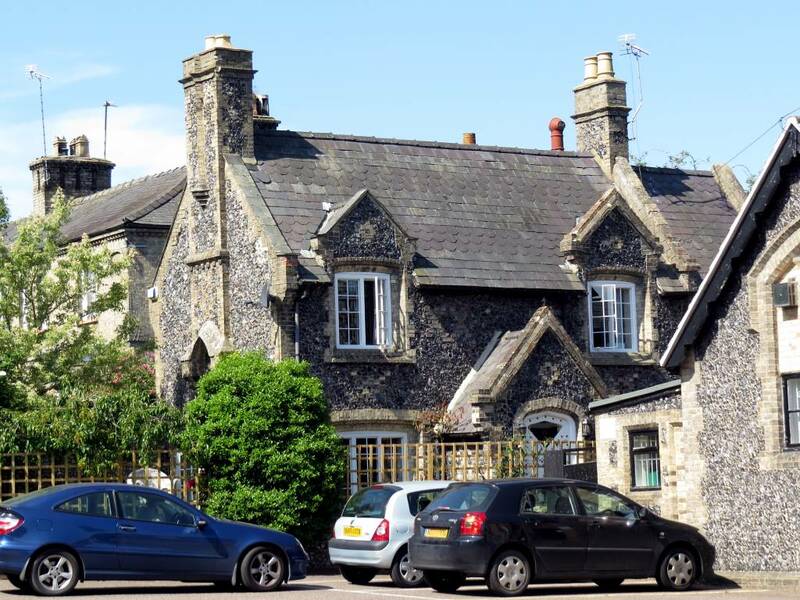 Soon after the start of WWII the government set up what they called 'British Restaurants' throughout the country to provide communal catering during the war years and after being empty for about a year the former girls' school was seconded for this purpose. The restaurant also catered for the many servicemen stationed in Newmarket. The boys' school also served its purpose during the war and became a buffer depot for food storage. 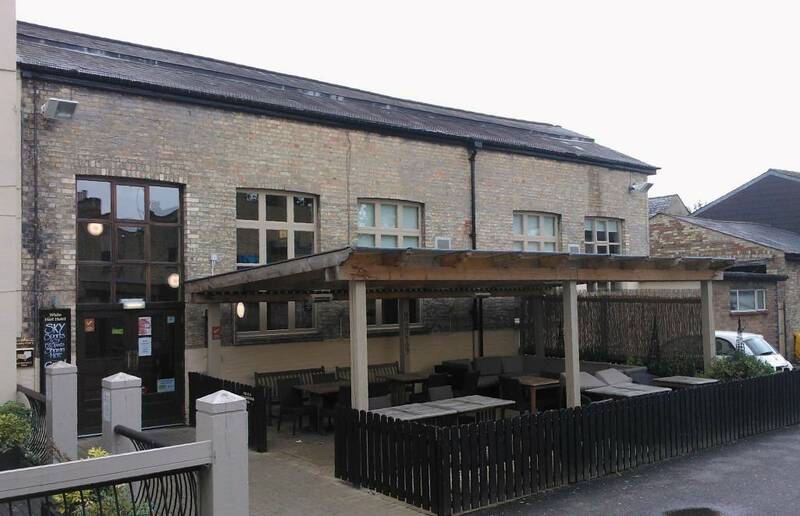 Another example, the British Restaurant in Cambridge continued for many years after the war up until 30th March 1972 and was then called the Civic Restaurant. The style of the restaurant was very much like a school canteen, where you queued up along a corridor at a long counter to select your food, paid the cashier at the end and then scouted around in the main room to find a free table. Cambridge's Civic Restaurant, one of the last in the country, will be closed on March 30 after 30 years of service stretching back to the days of British Restaurants. The old Post Office building, where it is situated, is to be demolished to make way for the next stage of the Lion Yard development. The restaurant which for several years has served an average of 1,000 lunches a day has been there since 1947. Before then its previous home since 1942 had been the Pitt Club in Jesus Lane. It was then that it was known as a British restaurant, one of the thousands set up by the Government throughout the country to provide a communal feeding service during the war years. Cambridge's Civic Restaurant was a very large high-ceilinged room - the British Restaurant here in the former girls and infants school was a much smaller affair, but served the same purpose and was run in the same manner as a school canteen, which was also still one of its prime uses during that time. 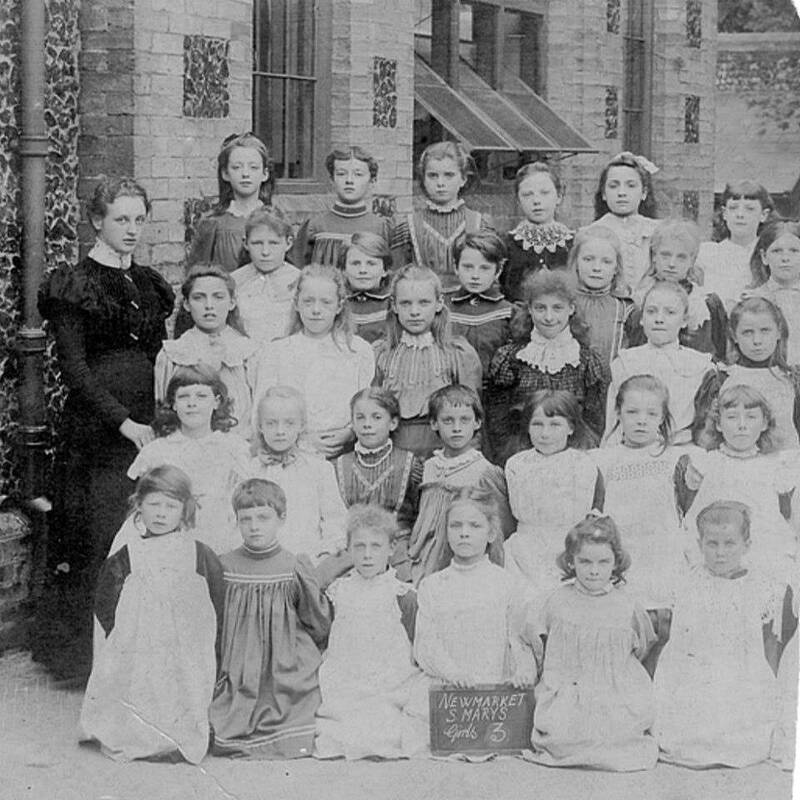 Following on after the war and during the 1950s, pupils from the nearby Foley House Grammar school, as the school didn't have a canteen, had to make a daily lunch-time trek through St Mary’s churchyard and up Fitzroy Street here to the former girls’ school. Space was limited, and girls went first one week, boys first the next. The building housed not only the school canteen (furnished with large folding tables and benches that seated four on each side) but also the library. The food was delivered in metal containers, having been prepared in the kitchen of the Secondary Modern school. Called the Fitzroy Rooms or Fitzroy Street Rooms after the war, the building was used for various purposes, one of which was the Fitzroy Queen's Club - a pensioner's club. The club Chairman was Edgar Pilgrim (full name Edgar Cecil Bunyan Pilgrim), who worked for the Post Office in Newmarket. During WWII he'd been in the Royal Engineers, Postal Section. On 31st January 1916 Edgar married Florence Moon at St Mary's church ... younger sister to William James Moon, founder of Moon's Cycle Shop. Other club members included Frank Cooper and Doreen Butcher. Following the opening of the theatre for the NOMADS the club moved to Foley House (many thanks to Bill Smith for the details about the club and its members). Captain Herbert Ryder King, C.B.E., lived in Graham House, Birdcage Walk in Newmarket. The son of Henry James and Maud Harriet King, he was born on 26th June 1889 in Kimberley, South Africa. His father, Henry James King, was born in America in 1849 and was a diamond merchant in South Africa. In 1891 he was living in Marathon House, Paddington, London and in 1902 he acquired Graham House & Graham Place, Newmarket, building a new house in Graham Place in 1903. In 1913 he purchased Poles Park country house, Ware, Hertfordshire and built new stables for his racehorses and had a nine-hole golf course laid in the grounds. Henry James King died on 18th July 1920, aged 71, at Poles Park, leaving £¾million in his will to his son Herbert amongst others. Interestingly although he died in Hertfordshire Henry is buried in Newmarket Cemetery. Captain Herbert Ryder King served in the 4th Battalion, Durham Light Infantry in 1914-1919 and again in 1924. The battalion was at Barnard Castle when war broke out in August 1914. The battalion was mobilised and moved the Tyne defences. In December the battalion moved to Killingworth then to Forest Hall in January 1915 and finally to Seaham Harbour in September 1915, where it then remained for the rest of the war as part of the Tyne Garrison. Captain King's older brother Nathaniel Walter Ryder King attended Eton and can be see boarding there in the 1901 census. Like his younger brother he also joined the army; and was in the Lancers in 1905. Following his retirement from military service he can be seen at Graham House, Newmarket in the 1911 census, his father was absent at the time. Upon the outbreak of WWI Nathaniel re-enlisted to the 16th (The Queens) Lancers, serving as a Lieutenant, but was killed on the front on 21st February 1915 and is buried in Ypres. Captain King became quite influential in Newmarket and was Chairman of the West Suffolk County Council when he was awarded the C.B.E. on 1st January 1946. 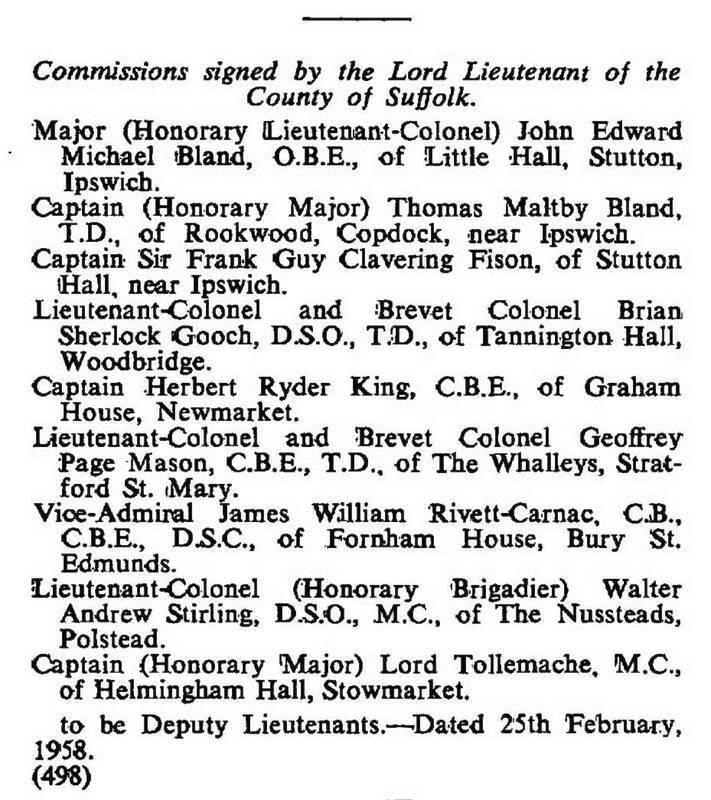 He also became a Deputy Lieutenant of the County of Suffolk on 25th February 1958. 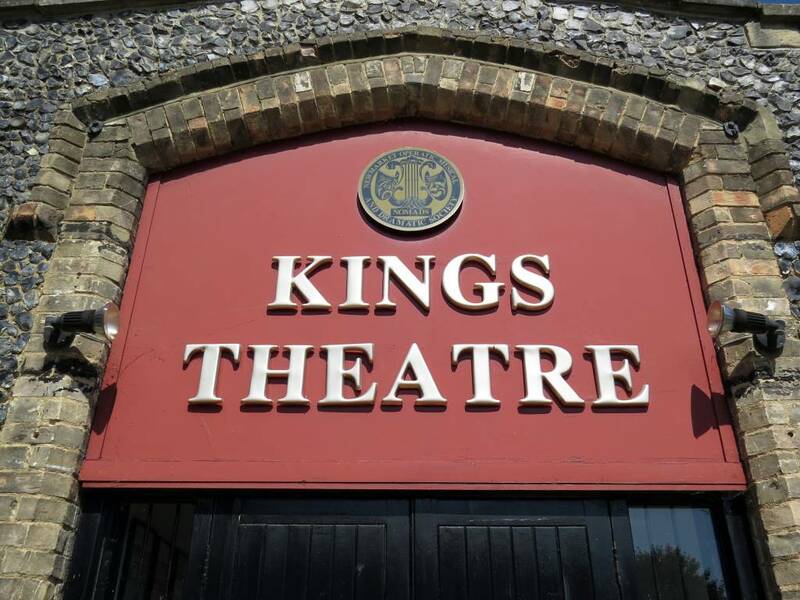 Captain King had been a fledgling member and Chairman of the NOMADS (Newmarket Operatic, Musical and Dramatic Society), which although not having a permanent theatre had been using the 1941 bomb damaged ballroom that stood in the rear yard of the White Hart Hotel. 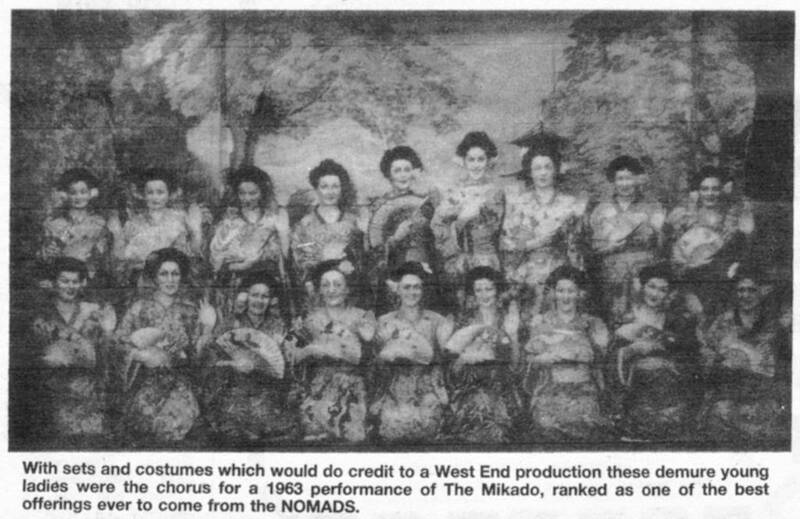 In 1954 their tenancy of the ballroom came to an end, but previously in 1949 Captain King had purchased the then Fitzroy Rooms, and over the next few years and a lot of effort it was progressively converted to a working theatre, with the society's first production being held there in March 1955 - this has variously been reported as being the musical 'Iolanthe' or the melodrama 'The Murder in the Red Barn' (if anyone can answer as to which it actually was please E-MAIL). One of the most striking features is the sloping floor of the auditorium. An impressive and effective ceiling and a commodious orchestra pit are other outstanding features in a hall well lighted and decorated and with an excellent heating system. 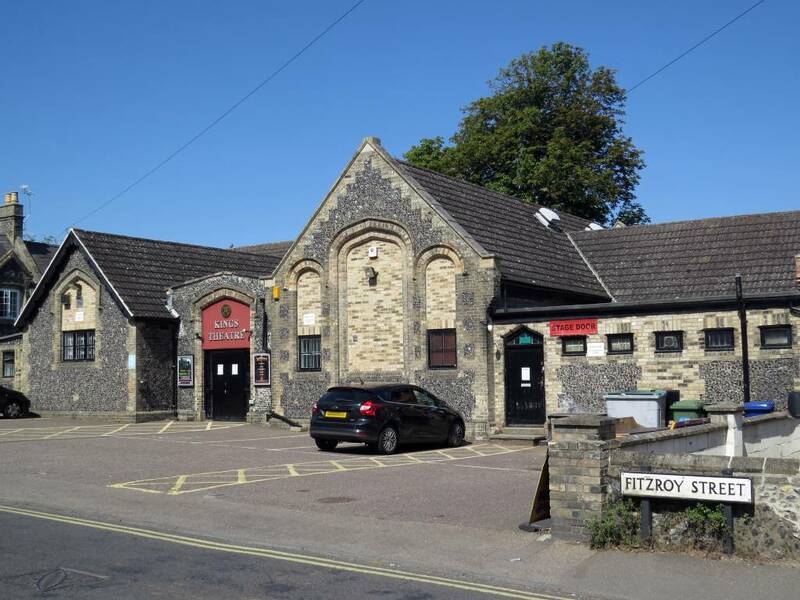 There is added stage space, good dressing room accommodation and a lighting system that cannot be bettered anywhere. The town has certainly been provided with a place of entertainment of which it can be proud. 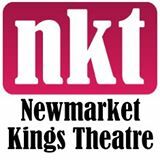 The NOMADS paid Captain King a rent of the four front row seats for each of their shows until his death in Newmarket in June 1971 aged 82 ... at which time he endowed the theatre to them in his will. Now renamed the King’s Theatre, it seats an audience of 123 and following grants from Forest Heath District Council, East Cambridgeshire District Council and a grant of £60,000 from the National Lottery in 1994, over the years the interior has been substantially renovated and restored with recovered seats, replaced carpets and ceiling, walls painted and enhanced lighting. 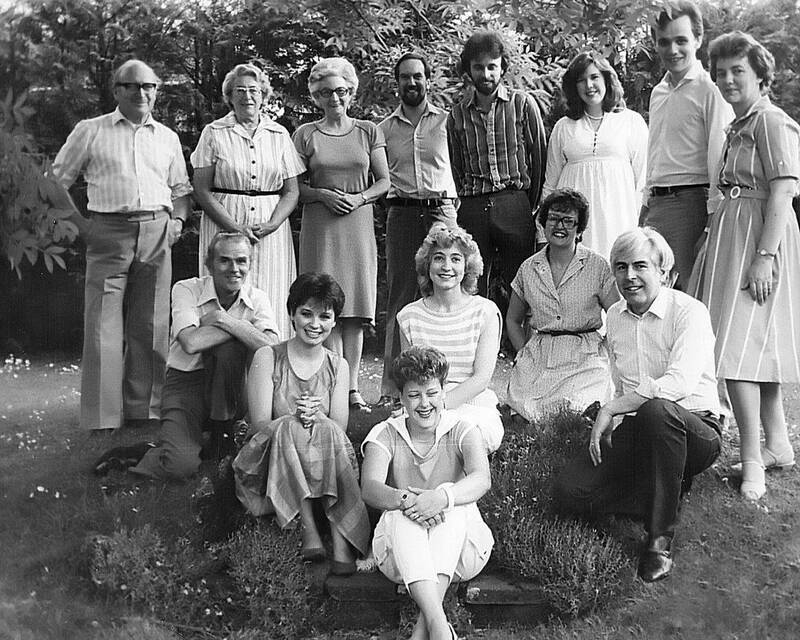 One of the most active members of the theatre group, Wallace Wareham joined the NOMADS in 1971 and founded the youth section in 1980. A Newmarket resident since 1965, in January 2013, aged 75, he moved to Horwich, near Bolton, to be closer to his daughter. 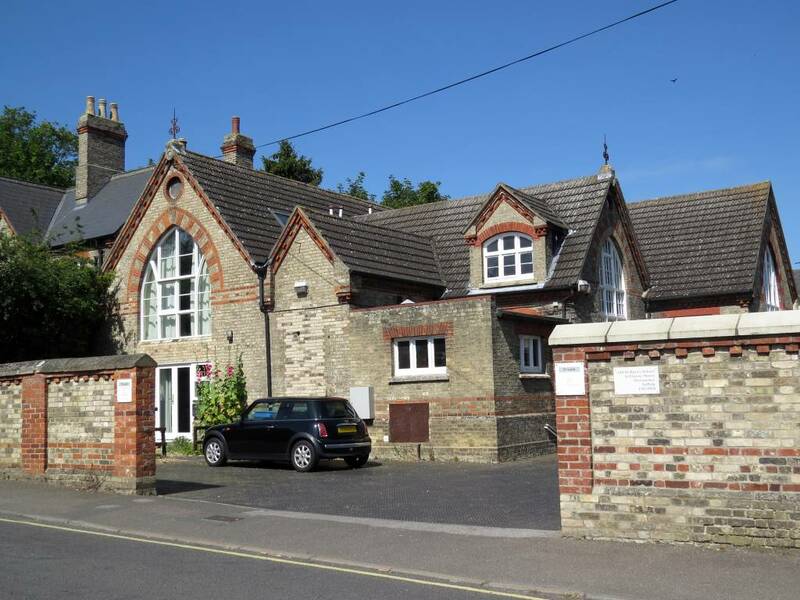 John Turner seems to have been the first schoolmaster at the new St Mary's boys' school from 1875 until 1885 when he moved from here to the newly built Glenwood College School in the High Street. He was replaced by John Graham from Bedford, who'd previously been the schoolmaster at a school in Chesterton, Cambridge. Sometime between 1904 and 1911 he moved from St Mary's to Hammersmith in London. Vernon Swift, listed in the boys' school from 1911 until 1926, was born in Sheffield, Yorkshire in 1873. He's not listed in the 1936 Newmarket Directory. He died on 31st October 1954 in Rockley, 7 Wesley Road, Ambergate, Derbyshire. The boys' school subsequently became the Newmarket Library, where it stayed for many years, until it later moved to its present home in the newly built Rookery Shopping Centre in 1974 (now the Guineas Shopping Centre).